Humans, aliens, and dragons. Who will inherit the galaxy? They said aliens didn’t exist, until they landed on the White House lawn. They said dragons didn’t exist, until they arrived in the galaxy . . . To turn it into cosmic dust. A new threat from beyond the galaxy rim has emerged, taking the lives of humans and aliens across the Milky Way. They look like dragons. They sound like dragons. They burn our cities like dragons . . . and apparently our spaceships too. Captain Rebecca Foster is no stranger to saving the galaxy from mythological beings that shouldn’t exist but do. 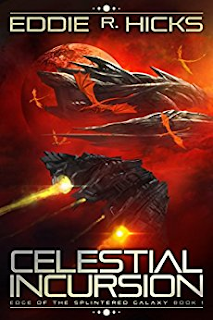 Dealing with dragons from beyond the galactic rim is a task she and her crew are more than qualified for. The new Earth government, however, disagrees, and sends the Marines instead, grounding Rebecca and her crew until further notice. And then things don’t go according to plan . . .
Salvation for the galaxy now lies in the hands of Rebecca’s ability to get back into the captain’s chair and show the galaxy how you slay dragons with 22nd century weapons and technology.